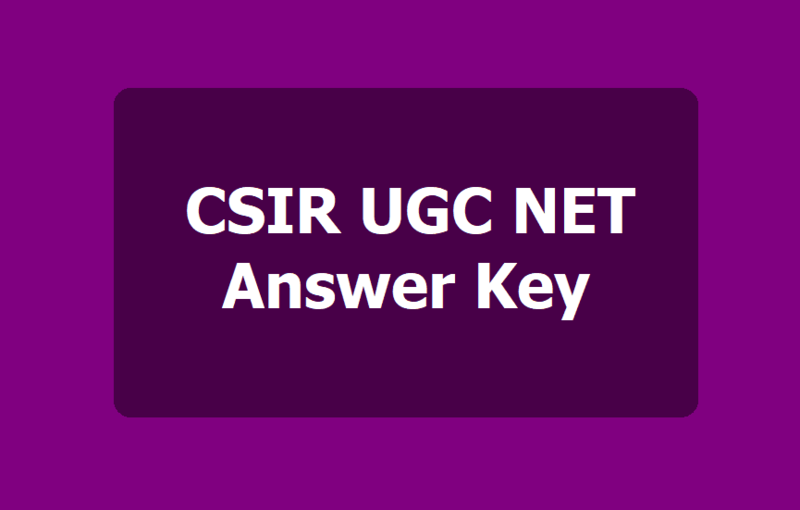 CSIR UGC NET 2019 Answer Key released for June session: CSIR has released the answer key of UGC NET 2019 for June session. Candidates who have appeared in the June session exam can download the answer key from the official site of CSIR at csirhrdg.res.in. Council of Scientific & Industrial Research (CSIR) has released the answer key of UGC NET 2019 for June session. The answer key was released on July 16, 2019. Candidates who have appeared in the June session exam can download the answer key from the official site of CSIR at csirhrdg.res.in. The answer key will be available to candidates from July 16 to 23, 2019. The answer key is available separately for five other subjects-Chemical Sciences, Earth Sciences, Life Sciences, Mathematical Sciences, and Physical Sciences. Candidates can raise their objections against the question/answer key through the latest email till July 23, 2019, 5 pm. The CSIR UGC NET 2019 was conducted on June 16, 2019. The exam was conducted in 27 cities across the country to test the eligibility of the candidates as teachers. For more updates, candidates can check the official notice available here. CSIR UGC JRF NET answer key: The Council of Scientific and Industrial Research (CSIR) has released the answer key for the joint CSIR UGC JRF NET exam held on June 16, 2019 on its official website, csirhrdg.res.in. The answer key will be available till 5 pm, July 23, 2019 only. Candidates have been given a window to candidates to raise objections against the answer key. According to the official notification. Candidates can submit their representation(s) against the answer key in respect of all the subjects through email. The last date to raise objections is July 23, 2019, till 5 pm. Official email if is netexam.obs@csirhrdg.res.in. Candidates can send the representation in form of word/PDF/image in attachment. The subject line of the email should have the name, booklet code and question number, according to official notice. The relevant portion of books or other finding supporting the claim should also be sent along with the email. CSIR has informed that, All the candidates who have appeared in CSIR JRF NET June‐2019 examination held on 16/12/2019, the answer keys of all the subjects is available on CSIR‐HRDG website www.csirhrdg.res.in from 16/07/2019 to 23/07/2019 (till 5 PM). The candidates may submit their representation(s) against question/answer key in respect of all the subjects through email latest by 23/07/2019 (till 5 PM). Candidates are advised to read instructions for sending representation available on our website www.csirhrdg.res.in. The representations received on email after the stipulated date or without any documentary/textual support, shall not be entertained. The representation(s) submitted by post or in person will not be accepted. All the representations received within stipulated dates will be given due consideration and decision taken in this regard will be final. While every care has been taken to ensure the accuracy, if at any stage, any discrepancy comes to the notice, CSIR‐HRDG reserves the right to rectify the same and no claim whatsoever will be entertained if any person/candidate is affected in the process. 2. Candidate is allowed to send representation, if any, in prescribed Format (Word/PDF/Image) as attachment with email. 4. Candidate must send only one email for one question. Separate email should be sent for different question. 5. The representation/grievance must be supported with only relevant portion of books/findings to be attached along with the email. Candidate should refrain from sending frivolous emails. 6. Representation received in any other Format other than prescribed will be summarily rejected. The prescribed format shall be available on website from 16/07/2019 to 23/07/2019 (till 5 PM). 7. Candidate must mention his/her details in legible manner on format correctly. 8. Candidate should avoid sending multiple emails on same question. 9. Representation/grievance received by any other mode except by email shall not be entertained. 10. Any email other than representation/grievance received on netexam.obs@csirhrdg.res.in will not be entertained. 11. Representation/grievance sent on any other email address other than the prescribed will not be entertained. 12. Answer keys shall be available on website from 16/07/2019 to 23/07/2019 (till 5 PM). 13. Telephonic queries shall not be entertained. 14. No email inquiring for status of representation shall be answered. 15. Merely sending the representation shall not constitute right to candidate for award of marks. Last date for sending representation/grievance is 23/07/2019 (till 5 PM).